Enjoy outdoor living no matter what the weather with our top quality DIY Glass Veranda. Consisting of an aluminium frame you can enjoy widths of up to 5m using just two posts with projections up to 3.5m. The width of the veranda is the overall size of the wall palte across the wall. The projection is measured from the the wall to the front edge of the post. No matter what angle the pitch of the roof is, we will always make the projection the same. Please note that there is some overhang on the gutter profile which is important to consider when installing in a tight space. A central post is provided on widths over 4m on our Polycarbonate Veranda and over 5m on our Glass Veranda. This is the frame colour of the veranda. High quality verandas are heavy and need a solid wall to fix to. Our fixing and fitting instructions relate to those installing onto a brick wall with at least 5 courses of brick above the awning fixing point, which provides a solid structure to install. There are other possible ways to install a veranda should you not have this, for example, using spreader plates or brackets. Please contact us for advice before placing your order. 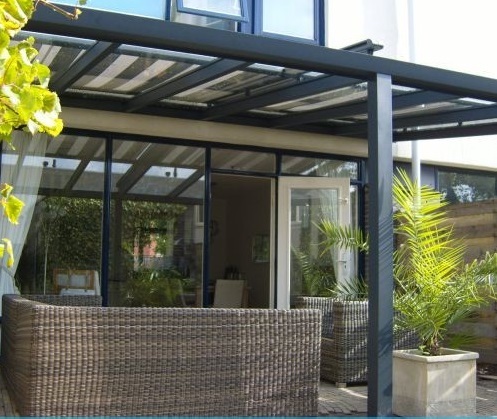 Our DIY Glass Veranda is the ideal solution for those looking for a top quality product but would rather reduce the cost by taking their own measurements and carrying out the installation themselves. It can be manufactured to any size with a pitch from between 7 - 15 degrees and comes in either white, ivory or textured anthracite however any RAL colour can be achieved for a surcharge. The glass required is 10.8mm safety laminated glass and the glass sizes required will be provided upon confirmation of your order. 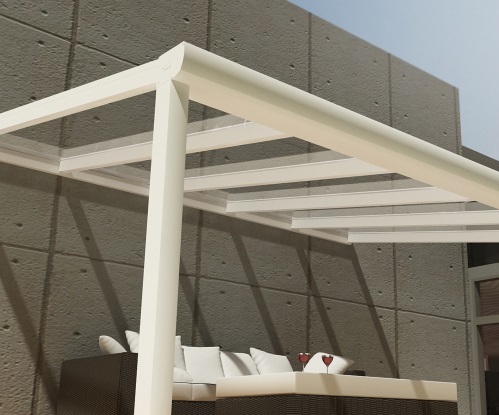 The Veranda incorporates an integral gutter system with drainage through the base of one of the posts. To ensure the conformance of the required EU regulations of weight loading of 70kg per M2 this is a heavy duty structure and the glass required is very heavy. A minimum of two people, and maybe more, would be required to install this Veranda. Each veranda is manufactured to suit your specification. For the standard frame colours manufacture usually takes around 4 weeks. For special RAL frame colours the manufacture will usually take around 6 weeks. Upon completion of your veranda we will contact you to make an arrangement to deliver your product. If you wish us to arrange the installation for you then this can be possible in some instances. We would require a photo to be provided of where you intend to install the veranda and a price will be provided. Installation usually is between £400 - £700 depending on what is involved. If you wish us to install the product then we are able to provide a cost for the supply of the glass if applicable.